Skipwith Hall – home to many Facilities Management work groups – received a Gold LEED certification, recognizing its many sustainable features. Leadership in Energy and Environmental Design (LEED) certification is an official recognition that a project complies with the requirements prescribed within the LEED rating system created by the U.S. Green Building Council. Gold certification is one of the highest levels of certification, with requirements spanning design, efficiency, materials and environmental quality. “This building is an example of the University and Facilities Management’s efforts to promote wellness and health of our employees and improve the day-to-day workspace of staff,” said Facilities Planning & Construction Senior Project Manager Amy Eichenberger. 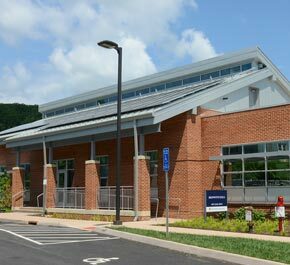 UVA requires LEED certification for all new construction and major renovation projects, and currently has 49 LEED certified buildings, representing over 2.1 million square feet. Skipwith Hall’s features that contributed to its gold certification spanned a variety of categories from construction practices to building design to occupant practices. During the 2015 construction of the building, more than 90 percent of the onsite generated construction waste was recycled and diverted from a landfill. In addition, close to 15 percent of the building materials content has been manufactured using recycled materials. Some of the green design features include the rooftop solar panel system that generates 15 kW of electricity during peak production, a green roof that captures storm water and provides passive cooling to the building and a curtain wall glazing system, which allows natural light into most work areas and hallways. In addition, the building is surrounded by permeable pavement to capture storm water runoff. Many of the building’s features promote the health and wellness of FM employees while also promoting sustainable activities, such as using alternative transportation. Showers and bike racks within the space make it easier for building occupants to bike or walk to and from work. These features also encourage staff to incorporate exercise into their workday routines. In addition, furniture was selected with ergonomic principles in mind, such as adjustable standing desks and standing chairs, meant to reduce pressure on the spine and prevent back injuries. The building has also incorporated Integrated Waste Management practices, which eliminate the use of individual trashcans and provide centralized waste, recycling and composting bins in an effort to encourage the diversion of waste from the landfill. In addition, the Custodial Services crew utilizes a Green Cleaning Policy, ensuring the cleaning products used are safe for people and the environment. A survey of Skipwith Hall occupants showed high satisfaction with the space, including 88 percent reporting that they were satisfied or very satisfied with the sustainability features of the building and 90 percent satisfied or very satisfied with the amount of natural light in the building.